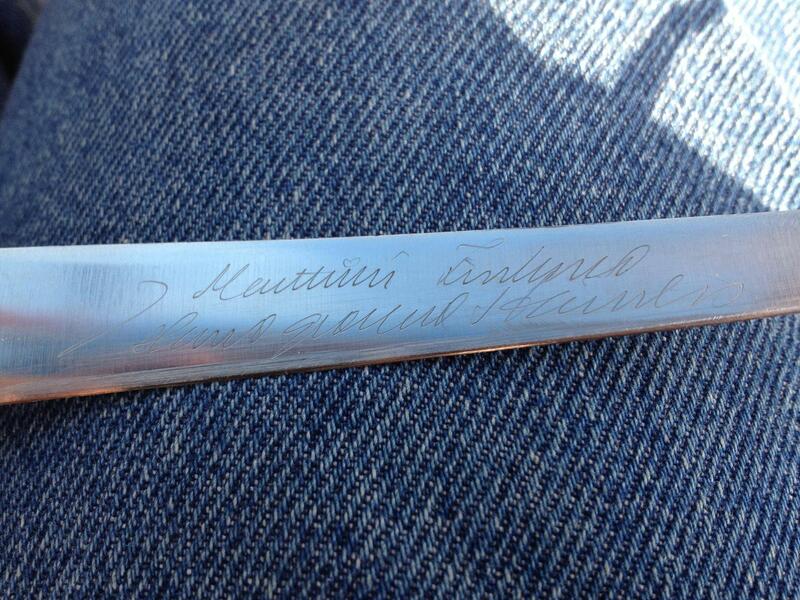 I've come to the conclusion that it probably says "Marttiini, England / Island around Hunters", although I could be wrong. "No e na'l cu barri"
> Looks like English to me - but I'm just about to go to bed now and am unable to brain. > Possibly a name, maybe Matthew, or some version of it, then a surname, maybe Finlay or England or something. > Next line, almost certainly "Island" then possible "around" and what looks like "Hunts". > A memento of meeting someone called Matthew Finlay on an island near somewhere called Hunts? There's a few islands between Hunts Point and La Guardia, New York. Where did you find the thing? >> the second word doesn't seems to be Russian handwitten script at all. >>> Hopefully this link works. I'd like help with translating what this says. >>> Any suggestions are welcome. Thanks!